More items purchased at an estate sale in Evansville, Indiana! I’ve grouped three bottle openers into one listing. They are: “NuGrape Soda, IMITATION GRAPE FLAVOR”, “STERLING, VAUGHAN U.S.A. PAT.1,996,550” , and the last one is “Have a Coke, Drink Coca-Cola” (on both sides of handle). 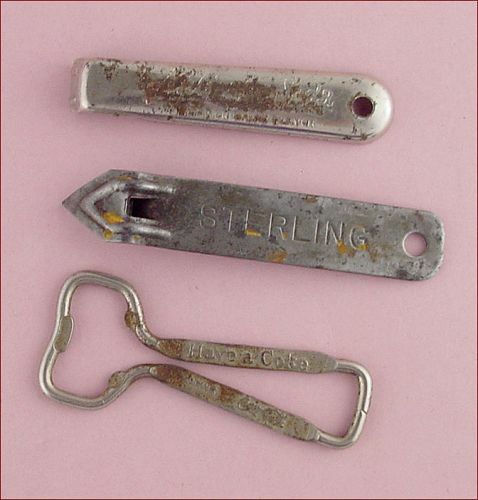 Each opener is in vintage condition as shown in photo. I have not attempted to clean or polish them and they are being sold as is. This is a neat McCoy item – a mustache mug! It measures 5 ¼” tall and bottom has McCoy’s pitcher mark, USA. Advertising stein is for “Your Father’s Mustache, 426 Bourbon Street, New Orleans”. It’s in wonderful condition with only “use” evidence being a ½” glaze slice type chip on bottom (underneath) – that’s it! This is a super cross-over collectible – advertising, alcohol, and Christmas! 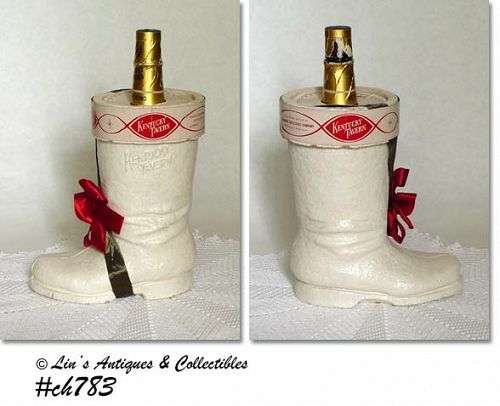 Papier-mâché boot is white with glitter, measures 8 ½” tall, and holds an (empty) Kentucky Tavern whisky bottle. This is a "book piece" and is in wonderful condition! Unmarked McCoy advertising mug made for Deo Optimo Maximo (a liqueur). 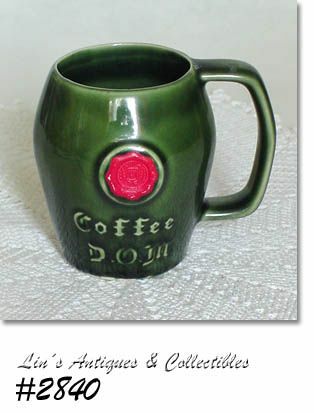 Mug is dark green with shiny glaze and has the red coat-of-arms/seal on front. Marked on bottom: USA. Excellent condition – no chips, no cracks! 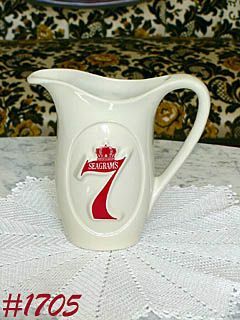 SUPER NICE MCCOY PITCHER MADE AS AN ADVERTISING ITEM FOR SEAGRAM'S 7! PITCHER MEASURES 7 1/4" TALL (AT TALLEST) AND WITH THE EXCEPTION OF A COUPLE CRAZE MARKS ON EXTERIOR BOTTOM (UNDERNEATH), IT LOOKS NEW AND UNUSED! PITCHER STILL HAS ORIGINAL RED COLD PAINT. 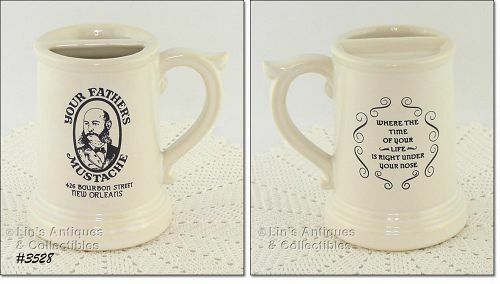 NICE ITEM WITH APPEAL TO MANY COLLECTIBLE MARKETS -- MCCOY, BREWERIANA, AND ADVERTISING! 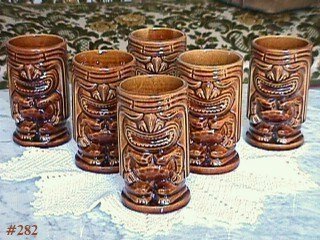 McCoy tiki mugs are ugly cute! There are 6 in this listing, each is 5 1/4" tall. They are in excellent condition -- no chips, cracks, or crazing. A wonderful addition to a McCoy or Tiki collection!